Cardiovascular Disorders Sourcebook, 6th Ed. Cardiovascular disease is the leading cause of death in both men and women in the United States. According to the Centers for Disease Control and Prevention, 715,000 Americans suffer a heart attack and 600,000 people die of heart disease in the U.S. every year. Yet careful attention to diet, exercise, and control of diabetes, cholesterol levels, blood pressure, and weight can often prevent cardiovascular disease. Further, treatment advances have reduced the disabling health consequences when cardiovascular disease does occur. 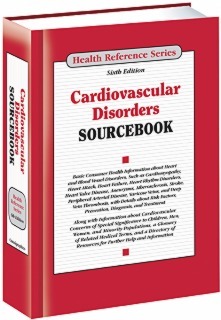 Cardiovascular Disorders Sourcebook, 6th Edition, provides information about the risk factors, symptoms, diagnosis, treatment, and prevention of disorders of the heart and blood vessels. Cardiovascular concerns specific to men, women, children, and minority populations are also discussed. This book is divided into parts and chapters. Parts focus on broader areas of interest. Chapters are devoted to single topics within a part. Part I: Understanding Cardiovascular Risks and Emergencies describes how the heart works, explains the known risk factors for cardiovascular disease, and offers details about the conditions that make it more likely that a person will develop a cardiovascular disorder. It discusses recent research on cardiovascular disease, and explains how to recognize a cardiac emergency and what to do when one occurs. Part II: Heart Disorders provides basic information about the types of disorders that affect the heart. These include problems with the heart’s blood supply, problems with the heart’s rhythm, heart valve disease, and arrhythmias, as well as heart failure, sudden cardiac arrest, and cardiomyopathy. Individual chapters include information about the development, symptoms, diagnosis, and treatment of each disorder. Part III: Blood Vessel Disorders discusses the types of disorders that affect the arteries and veins, including atherosclerosis, carotid artery disease, stroke, disorders of the peripheral arteries and veins, and aortic disorders. It explains how these disorders arise, what their symptoms are, how they are diagnosed, and how they are treated. Part IV: Cardiovascular Disorders in Specific Populations describes the unique ways that cardiovascular disease affects men, women, and children. It also offers statistics on the occurrence of cardiovascular disorders in each of these populations, and concludes with a discussion of cardiovascular disease among minority populations in the United States. Part V: Diagnosing Cardiovascular Disorders explains the methods used to recognize and diagnose disorders of the heart and blood vessels. It describes diagnostic tests, including blood tests, electrocardiogram and echocardiography, coronary angiography, stress testing, and Holter and event monitors, and it explains how to prepare, what to expect, and which risks are associated with each test. Part VI: Treating Cardiovascular Disorders discusses medications and procedures used to treat these disorders, including, catheterization, coronary artery bypass grafting, stenting, and pacemakers. It also includes a discussion of aneurysm and heart defect repair, heart transplant, and the use of the total artificial heart. The section concludes with a discussion of cardiac and stroke rehabilitation techniques. Part VII: Preventing Cardiovascular Disorders describes the things that can be done to help prevent heart and blood vessel disease. It explains how to control risk factors such as high blood pressure, high cholesterol, diabetes, and stress, and it offers suggestions for increasing healthy behaviors, such as maintaining a heart-healthy diet, managing weight, incorporating physical activity into a daily routine, and quitting smoking. Part VIII: Additional Help and Information includes a glossary of terms related to cardiovascular disease and a directory of resources offering additional help and support. “The abundance of information can seem overwhelming, but the book does an excellent job of organizing it into eight parts which describe the major disorders of the heart and blood vessels, targeted populations, diagnoses, treatments, and prevention. Further, the chapters addressing specific populations are extremely helpful in noting how the effects of CD vary among children, men, women, minority populations, and others.